First things first: do you see that pretty, Pinterest-esque graphic at the top of this post? I made it myself, using this cool, new, FREE program that I recently learned about. (And no, this is not a sponsored post. I just really like the program.) It's called Canva, and it allows you to make blog-friendly graphics without any real design knowledge. I've only just started playing around with it, but so far I really like what I've seen. Second things second: I'm posting a recipe! Remember when I used to do that fairly regularly? Even though I'm not a talented food blogger by any stretch of the imagination, my recipe posts are some of my most popular content. (My carrot cake is on the first page of Google results for "best vegan carrot cake recipe," a fact I like to share with anyone who will listen.) I wanted to start posting recipes again, but the last thing the Internet needs is another generic food blogger, so I tried to think of some kind of niche to which I could hitch myself. And I think I've figured it out: vegetarian recipes that are easy, simple, and cheap. That is the criteria for almost everything I cook, and it seems like a useful thing to share with others. 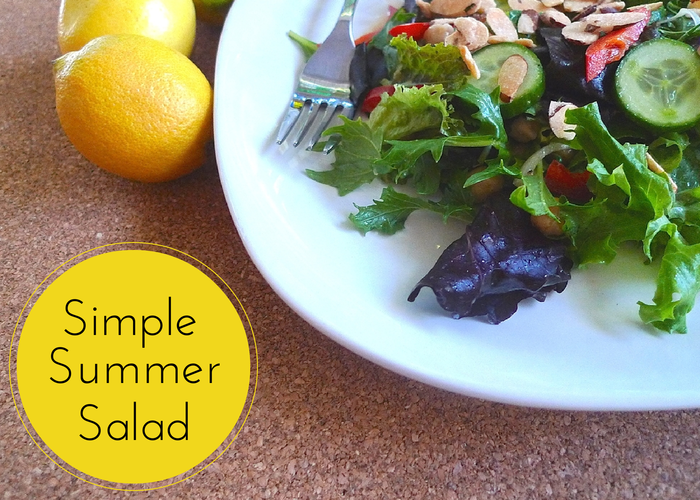 To kick off this new "Easy Eats" series, I present the easiest recipe of all time: a simple summer salad. I know what you're thinking: Salad? Really? Yes, really. It's summer, I don't feel like cooking, and I've been making this exact salad a few times a week for the last month. It's a winner, and it deserves to be shared. First, make the salad dressing by pouring all the ingredients in a small jar, covering the jar tightly, and shaking until it's completely blended. Next, combine the salad ingredients. Then, pour the dressing over the salad. Mix thoroughly, until the dressing is evenly distributed. Finally, eat the damn salad. I usually get three big salads out of this. It's filling and tasty, and I am never buying salad dressing again. Especially because yesterday I was reading labels in the grocery store and balking at the hidden sugar in pretty much everything. Bottled salad dressing, obviously, but even bran flakes! It was ridiculous, and I resolved then and there to make everything I could from scratch. This salad was an excellent start. For more (mostly) healthy vegetarian meal ideas, check out my recipes tab.